The weight loss market is saturated with products that promise to make you thin without any mention of diet, exercise, or the need to put down that extra chocolate bar. But from what we know, there’s no magic pill or any single solution to weight loss; it takes a combination of efforts to change metabolic function and increase muscle mass. Physical exercise causes more calories to burn than any other activity. The more intense the exercise, the more calories the body burns – and the duration of the exercise also improves the result. Simple things like running and walking can make a big difference in the way the body burns calories because you have to generate energy to fuel the activity. 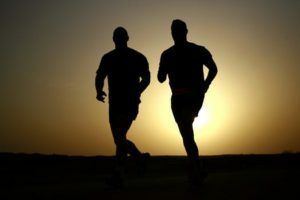 But even after the exercise has ended the body is still left burning calories – sometimes for up to 24 hours, depending on body type and duration of exercise. Start slowly and then gradually increase your workout time for best results. Strength training is meant to do one thing; build muscle mass. The process of building muscle requires significant amounts of energy, which is why strength training burns a lot of calories. Even when you’re not exercising, a person with more muscle mass will automatically burn more calories per day than a person with more fat. One researcher estimates that 10 pounds of muscle burn 50 calories per day (at rest), while 10 pounds of fat burns about 20 calories. Mix up your breakfast and make sure to eat more raspberries, oatmeal, peanut butter, whole eggs, and avocado. A good breakfast fuels you up and prepares you for the day ahead, and without it you’re more likely to snack. To kick-start your metabolism, make sure to eat more proteins and fiber, and include a slice of fruit or fruit juice to broaden the nutrients. Caffeine has a stimulating effect on the body- and anything that stimulates the body also causes it to burn more calories. One effect of stimulants is they give you a feeling of having more energy, which causes you to move more than you normally would. Caffeine products such as Fit Tea are known to increase metabolic function in the short term, and this means more calories are converted to energy. A number of studies have been conducted to determine the effect of green tea on weight loss, and one study reported lower food intake and heat-producing effects that went beyond the caffeine content. Drinking green tea with meals was also shown to increase fat burning by up to 10%. Almost all biological functions utilize water to some degree. Drinking enough water makes it possible for the body to burn more calories per day – up to 100 calories. And it also keeps you insides clean and optimizes nutrient absorption, which is important when you’re trying to get essential nutrients to power your weight loss efforts. Most people don’t realize how important it is to do simple activities that require energy. Climbing stairs takes twice the energy you use to walk, which means that for somebody who has to climb up and down a building many times during the day, it’s possible to lose over a hundred calories per day just by running up and down the stairs. A study by the University of New Mexico found that climbing two flights of stairs per day can cause a person to lose up to 6 pounds per year. So if you’re climbing five or six flights of stairs every day, then you’re burning more calories than you realize. A post-meal walk is a quick way to burn extra calories and improve digestion. Scientists have found that a 10 or 15-minute walk can aid digestion and improve blood sugar levels. If you don’t experience abdominal pain, fatigue, or other discomforts when you take walks immediately after a meal, then you can use every opportunity to walk as a means to burn more calories, especially after a heavy meal. Walking just 30 minutes immediately after a meal will do more to burn calories than waiting until much later to start your walk. About the author: Lydia Mattern is a NASM Certified Personal Trainer at fitnessgoals, with a passion for writing and a love for chocolate. She enjoys long walks with a breeze and finding ways to make dessert healthy.